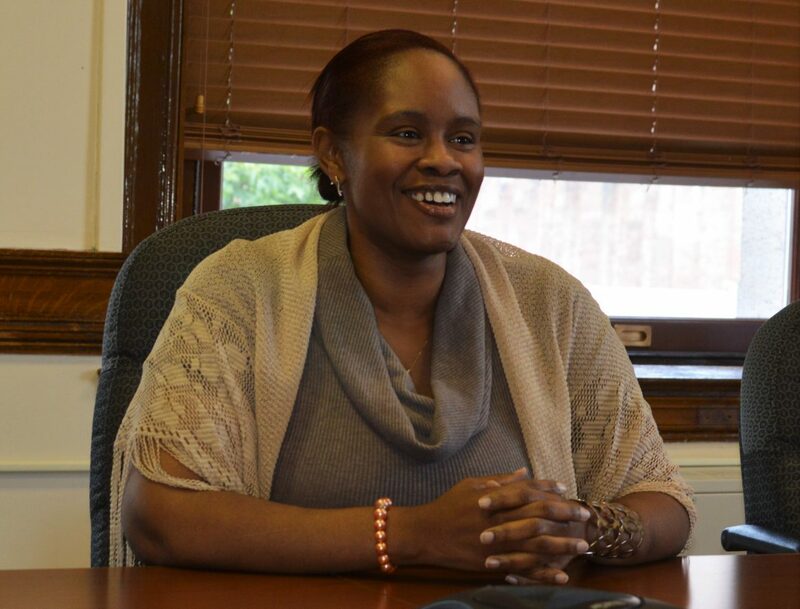 Malika Carter, Ph.D., was named the city’s first chief diversity officer on Jan. 15, 2016. In announcing her hiring City Manager Edward M. Augustus Jr. wrote: “The main duties of the position will include developing and monitoring, recruiting, hiring, training, promoting and retaining strategies to increase the number of people from underrepresented groups who work and volunteer for the city. The trail that led her to Worcester was steep. Carter, who says she grew up a “low socio-economic-statused” person, at first eschewed four-year colleges for Cuyahoga Community College in Cleveland, where her parents went back to school at ages 45 and 46. She got her associate’s degree in stenography so she could become a court reporter and earn money to continue her education at Cleveland State University. The punitive nature of the law, she said, made her realize she wanted to make education her career. She taught science, reading and language arts in grades 4-9 in Cleveland but was drawn to higher education. 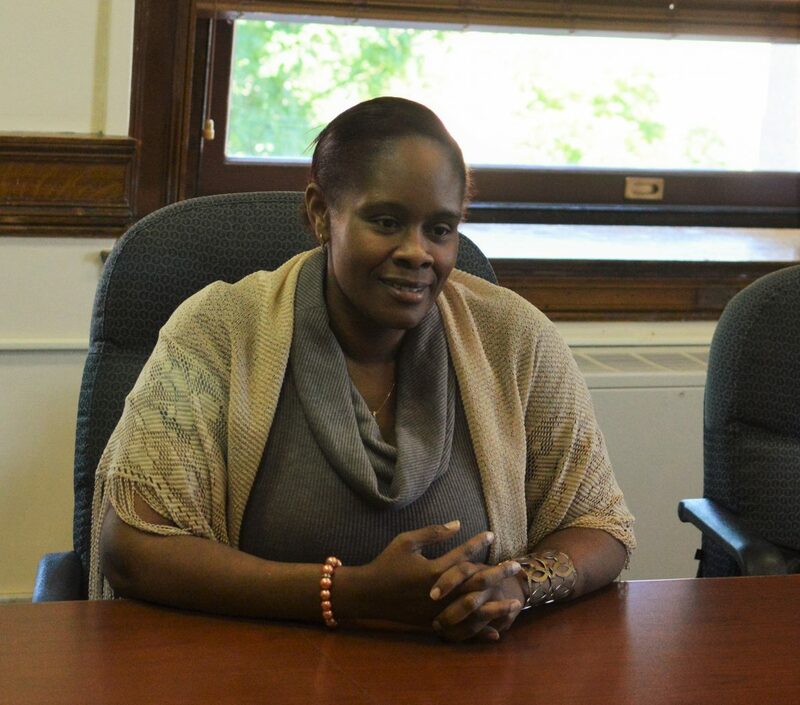 She earned a master’s in higher education and student affairs administration at the University of Vermont, working full time in the process. 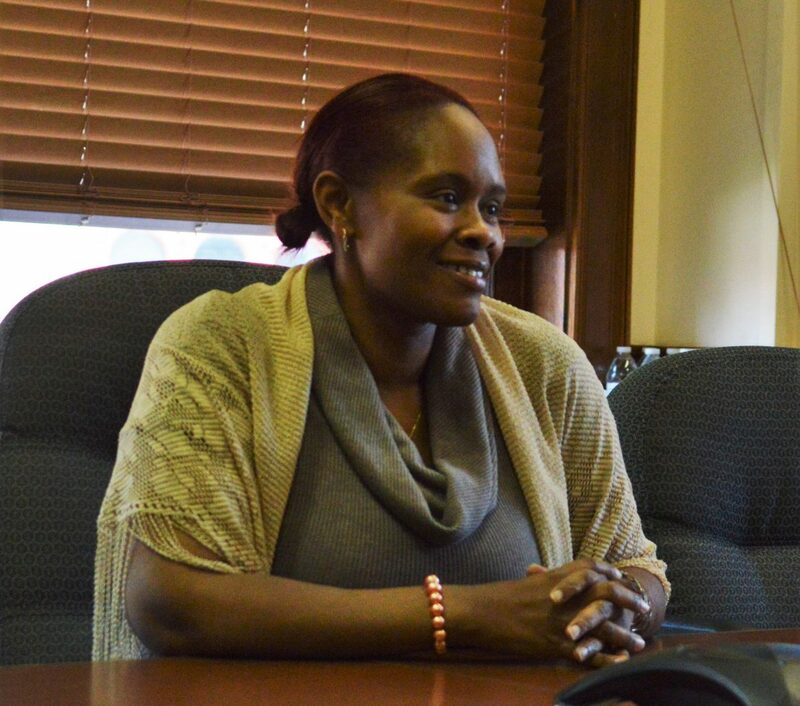 In 2005, Carter moved on to North Dakota State University, where she was assistant director of multicultural programs while continuing her education. In 2011 she became director of multicultural student services at the University of North Dakota. In 2014 she earned her Ph.D. from North Dakota State. Carter sat down with the Sun for her first extended one-on-one interview since coming to Worcester in February. 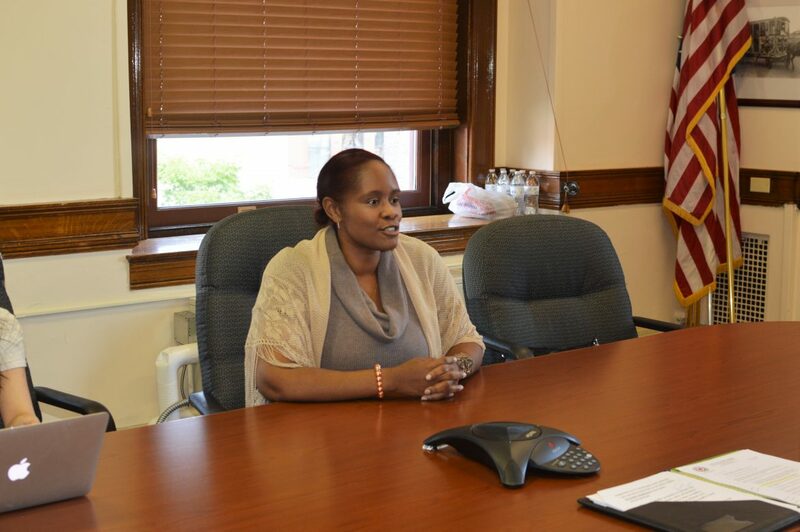 She talked about what prepared her for a city the size of Worcester, the city’s hiring practices, last summer’s dialogues on race, a recent incident involving a member of the city manager’s cabinet, the role of media, and difference between threats and free speech. What was it that best prepared you for a city the size of Worcester? I would say colleges and universities, they educate the world literally and because of that they’re well prepared to engage with a variety of different people. Then there are also things that make institutions that large have to be compliant with federal, state and municipal governance. Because of that, I was very familiar with some of the compliance issues that also pertain to the city of Worcester. Examples would include things like Title IX, equal opportunity, affirmative action, even the noncompliance things, the things that we want to make sure that people know: civility, customer service, things like that. Whether it’s the compliance route or the educational route, I’m good at both. That is what serves me well in this role. The city manager has said you have a strong understanding of the issues facing underrepresented populations and have worked to build a cultural competency, improve relations and collaboration among people with diverse backgrounds. Let’s take those one at a time. What do you think are the issues facing underrepresented populations in Worcester? There can be many. When many people look at me, they see an optic diversity. But there are other types of diversity beyond what we can see when we look at a person. There’s a whole story, a lineage behind them that we cannot even see. I see diversity with many different pieces. I see ability and disability. I see race, I see creed. I see historically underrepresented, which can mean we don’t have a lot of people that identify as female in a particular echelon or group. That can mean we don’t have a lot of people that identify as transgendered. So underrepresented group can mean a lot of different things. But when we talk about that at its basest, we’re talking about protected classes as in regards to EEOC compliance. Talk about cultural competency. How do you get that? How do you express that or convey that in city government? When I talk about diversity, inclusion, equity, equality, cultural competency, many people want a toolkit. And I’m using this as an example, “How do you deal with Turkish people on Tuesday?” I can’t tell you page three, paragraph three, section A, I can’t tell you that because we live in a very complex world. The identities that exist in the world are very complex and how we navigate them is complex. When we say cultural competency, I can give you a generality, but because the nature of the world is very complex, we also need to depend upon the humanity that we have because we can’t automatically label people all the time. Sometimes we can. So cultural competency, in your view, would be a general outlook about the person standing in front of you? It’s the difference between the golden rule and the platinum rule. The golden rule, we all know so I won’t repeat it. The platinum rule is you treat people the way they want to be treated because everybody doesn’t have your identity or want to be treated like you. You have to be cognizant about that. How do you improve relations and collaboration among people of diverse backgrounds? Diversity is people sitting around a table; there is diversity in this room right now. That’s a more palatable conversation to have. A difficult conversation is, “Why can’t one of us go to the bank across the street and receive a fair shake?” Maybe because of their gender or because of their stature, or because of their clothing or because of how they’re perceived. That’s a social justice conversation. That’s a more difficult conversation to have. Diversity is easy. It’s celebratory, it’s food, fun and festival. The difficult stuff, the in-the-weeds stuff, is understanding how we treat each other interpersonally, and then how we treat each other institutionally, and then socially, culturally. Say you call me out by name and it’s a misogynistic name, I can say, “Hey, let’s now do that at this level.” You can say, “OK, let’s stop.” Guess what? That still goes on at an institutional level. How do we know that? We can look around to see that women don’t get paid equally as men. How do we know that? We can listen to rap, R&B music, rock and roll, and we can look at videos and see there are 11 women standing around one man. We can see misogyny on television and in music. It’s still going on at other levels, even though you and I here have interrupted it. What smart people like us have to do is we have to interrupt it at other levels to make sure we’re moving society ahead in a positive manner. Since February, what have you been able to accomplish? One thing I was just able to do was to introduce something from the National Association of Mental Illness, a proclamation and pledge. That pledge is to share information about mental illness among people who work for the city, to address hiring managers and then employees. This is not a problem unique to the city of Worcester, but there are a lot of people who feel overworked and burdened. You also have individuals who may not necessarily see their jobs in traditional ways as baby boomers have seen them. So you have many individuals who say, “You know, I have a family and I’m leaving. I’m not here until 10 at night.” When many people, because of their loyalty and because of how they were raised, and the set of values they’ve come along with, are different. We have a variety of generations working for the city of Worcester, and we have to be malleable in many ways. So bringing attention to that will open the gateway to understanding who the millennial is and how the city should be operating differently not only for workplace wellness and mental health but also the work-life balance that we all strive for. In addition the city manager said he’d like to broaden the pool of candidates for city jobs. How do you do that and how do you think it’s going? You do that by addressing the hiring practices. There are over 30 departments in the city and what I would like to do is make sure that those practices are normalized, fair and equitable. People should be having a uniform experience when they apply for a job with the city. We should also be allowing people to say to us, “You know what? I want to question why is it that I wasn’t chosen for this job?” And we should be able to say, “Here you go. This is exactly the process we followed.” Not only is it the process that this department follows, but all departments follow this. That also means normalizing the EEO statement or Affirmative Action statement we have for the city. I’ll be frank, I looked at different [job] descriptions and saw different statements. That should not be. My job is to make sure we are normalizing the processes, normalizing the language, and making sure that’s uniform across all departments and creating a common perception so we can all move forward and reduce the amount of scrutiny we may receive. But how do you broaden the overall pool of applicants? Are you saying just by doing that the pool with grow? That’s one piece because that creates perception. So when you try to make your processes fair and equitable, of course more people want to participate. But when they have a perception about you that you close things off or do things privately, I don’t want to work for them. I want to work for you because you’re a fair employer, because I know my identity is welcomed. We’re putting together a resource guide so as people are considering applying, they’ll receive from us some things that our city celebrates regarding underrepresented identity or historically absent identities in the city. Once you arrive, we’ll give you an opportunity to join the employee resource group. When people express interest we can put them on a hiring committees to walk people around because they share a like identity with a person. Does that indicate to you the city has not been proactive enough to ensure underrepresented communities know about jobs with the city? What that says to me is that there’s always room for improvement. There’s a lot of people doing a lot of great things to make sure that people understand what opportunities we have. There’s a lot of great work being done. However, what I consistently hear from people from underrepresented communities, “I didn’t even know” [about jobs]. So what we’ve done, my colleagues in Human Resources and I, is to put together a flow chart. How do you apply for jobs in the city of Worcester. If you want to apply for a non-civil service job, what does that look like? You want to apply for a civil service job, what does that look like? We’ve been to several job fairs to share information with underrepresented people. What we’re trying to make sure there is also outreach. What does the city do well regarding diversity? There are so many things that I have seen that are positive. Here are a couple. There have been different opportunities where all the employees in City Hall have the opportunity to come and be trained. On the customer service issue, it’s dealing with individuals in a way that makes them feel welcome here. And also a part of the conversation is how to be safe in a building that is wide and open. Another thing that the city does well is coming: rebranding its online presence. There’s so much input that has gone into it, it is not unveiled yet, I don’t know when it is coming. But there are rumblings and people are really excited about it. So that’s happening soon and people seem to really like that. I feel there are a lot of breaths of fresh air. They’re not like a mighty rushing wind. They are small breaths. There are lots of people with lots of ideas, and some of these ideas extend broadly and you can see them publicly, but some of them are private and small. I’ll give you two examples of one public and one example of one private. The public one is the Out to Lunch series. It’s excellent. There are different types of music, different types of activities for people to enjoy and they relate to different types of cultures. Is the city’s workforce as diverse as it should be, less diverse or more diverse? The city’s workforce is not as diverse as it could be, and the reason for that is because our city is constantly changing, and our city should reflect the individuals that live here. And so right now it doesn’t. I can easily say that to you. It does not. And so until that happens, until we meet or surpass that goal, that would be the case. Your position as we understand is to help foster diversity in the city government. But what do you see is the city’s role in accomplishing that within the community? Every department has a content area-specific knowledge. They also have contact area-specific partners. We all have expertise that is different and partners and stakeholders that are different. We cannot be insular and siloed and do our work alone. We have to work external to the city. So not only my role, but everybody’s role, is to reach out wherever there’s opportunity to do more good work, not only to diversify but to build equity and make the playing field fair and equitable. That’s because historically, let’s face it, it has not been. Institutions were not built for under represented people. They were built for power, to keep the power in and keep the powerless out. Because we’re not immune, what do you see is the media’s role helping promote and ensure diversity? I would just say, “Pay attention.” Pay attention to unlikely places that generally do not get heard. When you turn on a television or when anybody opens up a paper, what they should be seeing is the underrepresented voice as well. Not only the voice that garners the most attention because of historical power or historical wealth, but they should be hearing underrepresented voice as well. So I think we need to give honor to people who don’t have what they do have they’re good stewards of. And I think once we begin to diversity our institutions will become better because of that. The city held seven community dialogues on race last summer. Did you review those or do you know of their existence? Yes. There were notes that were near and dear to my heart because I used to be a stenographer. And I have read the reports that have come out from that prior to coming here, and one of them when I arrived. I saw there were some populaces missing, some voices were missing, and I was wondering why. Who wasn’t talking? Who wasn’t there? So from afar, as a stranger, it made me question who wasn’t present and why they were choosing not to speak. Because when we talk about inclusivity we want to make sure that everybody’s given an opportunity to do so. What was your impression of the race dialogues? Were they a worthwhile exercise? Helpful? Harmful? Part of it was helpful in the sense that I was very pleased to see that these conversations were happening and that the Department of Justice was helping to move the dial on the conversation. That was very heartening to me. At the same time I didn’t want to cloud my a perception because I thought that would kind of bog my mind down. When you’re new to a place you’re able to look with fresh eyes and see things that you could do. The longer you’re there you get bogged down in your own agenda or into the agenda of others. And then it pulls away at your creativity because you have to get the dailies done. I was grateful for the opportunity to read about the dialogues. At the same time I also wanted to keep my mind somewhat fresh in order to be able to superimpose some of those things as they were appropriate because what may work over here may not work over here . I saw it as an informative piece about what the pulse of the community was. Otherwise, no major or earth-shattering conclusions. You’ve done work that was internal to the city and work that was external. Where is the balance and how do you get people to know about that? Opportunities like this, to speak with media, is one. Another would be some strategic planning, which I have began to pull together. I need to make sure what I’m doing is usable by a lot of different individuals within the city. What I’ll use or have at my disposal to post or place those type of strategies, I don’t know yet. Still working on that. As they come together, I think that we’ll be able to put platforms, not only cyber platforms, but very public platforms as well. Marketing campaigns, Twitter, Facebook, things like that. Physical postings in the community. I feel like there’s a lot of things that I yet have to learn in order to make those things public and not step on toes because there’s a lot of great things already going on, whether they be nonprofits or there be people who are internal to the city who are working. I want to make sure I’m working in tandem with and not going against the grain. There was an issue recently that’s been reported in both legacy media and social media. A member of the city manager’s cabinet was accused of using a racial epithet in a confrontation. What can you tell us about that? Well, I can’t tell you anything about it because it was a personnel issue. But what does the incident itself tell you about the state of diversity and race in Worcester? I can tell you the process we follow is integrous. Any process that the city is going to follow to do an investigation is integrous because I was a part of it. And I have no loyalties; I just got here. I’m very glad to have been a part of that process, and I’m proud of the work that I did there. When I was working in higher education I would get questions like this a lot, especially when there was a sexual assault or something like that. People, first of all, want to know what happened to the person who was being accused and then they wanted to know sometimes who the accuser was. We have to make sure that we protect the individual that is accusing as well as the accused. It would be disrespectful to the process that I followed and it will undermine the process if I were to speak about that in particular but even any peripheral issues as they relate. Every time I do an investigation, every single time and every single time that I receive public questions about that investigation, my answer is always the same. I want to make sure I’m protecting both the accused as well as the person that is on the other side. We have a variety of reasons for doing that. And I know that it’s kind of frustrating to some people. Is media more harmful to the process and your goals or is it helpful? It all depends the nature of the person you’re informing. If you’re speaking with [someone] who’s sloppy and has no idea about the policies that relate to what they’re doing, of course they’re going to be really big-footed and harm the processes that they’re involved in, whether those are visionary processes or those are confidential processes. I have tons of experience with that too. I mean you have people on different types of social media platforms. Sometimes you have no idea who the people are. If it’s a threat, we have to be able to negotiate those types of environments. What is the elevation that we should take this to? What should we be doing? The first thing we should do is look at the nature of what the threat is, if it is a threat at all. If it is just free speech, leave it at that because the hardest job I had to learn in doing this work is to be tolerant of the intolerant. People have fundamental beliefs and I’m not in the business of changing them. I’m the business of regulating group behavior if something is harmful to all of us. If it’s going to hurt any one of us, maybe that person shouldn’t be here. Maybe it’s best for them not to be part of our institution. But I’m not in the business of changing beliefs, not at all. I really believe that a white supremacist or somebody who is misogynistic or somebody who is anti-Semitic has a right to work. I really do. They have an absolute right to work. But when their behaviors start to impair the work environment, when their judgments start to pull away at the fabric of our common humanity, then we have a problem. This article was originally published in the June 29, 2016 edition of the Sun.